11 D None No Power Seat 11 D is a Business Class Bulkhead seat that has extra legroom. The proximity to the galley and lavatory may be bothersome. 11 E None No Power Seat 11 E is a Business Class Bulkhead seat that has extra legroom. The proximity to the galley and lavatory may be bothersome. 11 G None No Power Seat 11 G is a Business Class Bulkhead seat that has extra legroom. The proximity to the galley and lavatory may be bothersome. 12 A None No Power Seat 12 A is a Business Class Bulkhead seat that has extra legroom. This is a bassinet location and passengers traveling with infants may be seated in this area. The proximity to the galley and lavatory may be bothersome. 12 C None No Power Seat 12 C is a Business Class Bulkhead seat that has extra legroom. The proximity to the galley and lavatory may be bothersome. 12 H None No Power Seat 12 H is a Business Class Bulkhead seat that has extra legroom. This is a bassinet location and passengers traveling with infants may be seated in this area. The proximity to the galley may be bothersome. 12 K None No Power Seat 12 K is a Business Class Bulkhead seat that has extra legroom. This is a bassinet location and passengers traveling with infants may be seated in this area. The proximity to the galley may be bothersome. 18 A None No Power Seat 18 A is a Business Class seat whose proximity to the galley mat be bothersome. 18 C None No Power Seat 18 C is a Business Class seat whose proximity to the galley mat be bothersome. 18 H None No Power Seat 18 H is a Business Class seat whose proximity to the galley mat be bothersome. 18 K None No Power Seat 18 K is a Business Class seat whose proximity to the galley mat be bothersome. 39 A None No Power Seat 39 A is an Economy Class Bulkhead seat that has extra legroom. However, the proximity to the lavatory and galley may be bothersome. The tray table is in the armrest, making the armrest immovable and slightly reducing seat width. There is no floor storage for this seat during takeoff and landing. 39 B None No Power Seat 39 B is an Economy Class Bulkhead seat that has extra legroom. However, the proximity to the lavatory and galley may be bothersome. The tray table is in the armrest, making the armrest immovable and slightly reducing seat width. There is no floor storage for this seat during takeoff and landing. 39 C None No Power Seat 39 C is an Economy Class Bulkhead seat that has extra legroom. However, the proximity to the lavatory and galley may be bothersome. The tray table is in the armrest, making the armrest immovable and slightly reducing seat width. There is no floor storage for this seat during takeoff and landing. 39 D None No Power Seat 39 D is an Economy Class Bulkhead seat that has extra legroom. However, the proximity to the lavatory and galley may be bothersome. Also, this seat is a bassinet location and passengers traveling with infants may be seated in this area. The tray table is in the armrest, making the armrest immovable and slightly reducing seat width. There is no floor storage for this seat during takeoff and landing. 39 E None No Power Seat 39 E is an Economy Class Bulkhead seat that has extra legroom. However, the proximity to the lavatory and galley may be bothersome. Also, this seat is a bassinet location and passengers traveling with infants may be seated in this area. The tray table is in the armrest, making the armrest immovable and slightly reducing seat width. There is no floor storage for this seat during takeoff and landing. 39 G None No Power Seat 39 G is an Economy Class Bulkhead seat that has extra legroom. However, the proximity to the lavatory and galley may be bothersome. Also, this seat is a bassinet location and passengers traveling with infants may be seated in this area. The tray table is in the armrest, making the armrest immovable and slightly reducing seat width. There is no floor storage for this seat during takeoff and landing. 40 H None No Power Seat 40 H is an Economy Class Bulkhead seat that has extra legroom. However, the proximity to the lavatory and galley may be bothersome. The tray table is in the armrest, making the armrest immovable and slightly reducing seat width. There is no floor storage for this seat during takeoff and landing. 40 J None No Power Seat 40 J is an Economy Class Bulkhead seat that has extra legroom. However, the proximity to the lavatory and galley may be bothersome. The tray table is in the armrest, making the armrest immovable and slightly reducing seat width. There is no floor storage for this seat during takeoff and landing. 40 K None No Power Seat 40 K is an Economy Class Bulkhead seat that has extra legroom. However, the proximity to the lavatory and galley may be bothersome. The tray table is in the armrest, making the armrest immovable and slightly reducing seat width. There is no floor storage for this seat during takeoff and landing. 46 A None No Power Seat 46 A is a standard Economy Class seat that is missing a window. 46 K None No Power Seat 46 K is a standard Economy Class seat that is missing a window. 49 A None No Power Seat 49 A is a standard Economy Class seat that is missing a window. 49 K None No Power Seat 49 K is a standard Economy Class seat that is missing a window. 52 A None No Power Seat 52 A is an Economy Class seat that may have limited recline. The proximity to the lavatory may be bothersome. 52 B None No Power Seat 52 B is an Economy Class seat that may have limited recline. The proximity to the lavatory may be bothersome. 52 C None No Power Seat 52 C is an Economy Class seat that may have limited recline. The proximity to the lavatory may be bothersome. 52 D None No Power Seat 52 D is an Economy Class seat that may have limited recline. The proximity to the lavatory may be bothersome. 52 E None No Power Seat 52 E is an Economy Class seat that may have limited recline. The proximity to the lavatory may be bothersome. 52 G None No Power Seat 52 G is an Economy Class seat that may have limited recline. The proximity to the lavatory may be bothersome. 52 H None No Power Seat 52 H is an Economy Class seat that may have limited recline. The proximity to the lavatory may be bothersome. 52 J None No Power Seat 52 J is an Economy Class seat that may have limited recline. The proximity to the lavatory may be bothersome. 52 K None No Power Seat 52 K is an Economy Class seat that may have limited recline. The proximity to the lavatory may be bothersome. 53 A None No Power Seat 53 A is an Economy Class Exit Row seat that has extra legroom. However, the proximity to the lavatory may be bothersome. The tray table is in the armrest, making the armrest immovable and slightly reducing seat width. There is no floor storage for this seat during takeoff and landing. This seat is also missing a window. 53 B None No Power Seat 53 B is an Economy Class Exit Row seat that has extra legroom. However, the proximity to the lavatory may be bothersome. The tray table is in the armrest, making the armrest immovable and slightly reducing seat width. There is no floor storage for this seat during takeoff and landing. 53 C None No Power Seat 53 C is an Economy Class Exit Row seat that has extra legroom. However, the proximity to the lavatory may be bothersome. The tray table is in the armrest, making the armrest immovable and slightly reducing seat width. There is no floor storage for this seat during takeoff and landing. 53 D None No Power Seat 53 D is an Economy Class Exit Row seat that has extra legroom. However, the proximity to the lavatory may be bothersome. Also, this seat is a bassinet location and passengers traveling with infants may be seated in this area. The tray table is in the armrest, making the armrest immovable and slightly reducing seat width. There is no floor storage for this seat during takeoff and landing. 53 E None No Power Seat 53 E is an Economy Class Exit Row seat that has extra legroom. However, the proximity to the lavatory may be bothersome. Also, this seat is a bassinet location and passengers traveling with infants may be seated in this area. The tray table is in the armrest, making the armrest immovable and slightly reducing seat width. There is no floor storage for this seat during takeoff and landing. 53 G None No Power Seat 53 G is an Economy Class Exit Row seat that has extra legroom. However, the proximity to the lavatory may be bothersome. Also, this seat is a bassinet location and passengers traveling with infants may be seated in this area. The tray table is in the armrest, making the armrest immovable and slightly reducing seat width. There is no floor storage for this seat during takeoff and landing. 53 H None No Power Seat 53 H is an Economy Class Exit Row seat that has extra legroom. However, the proximity to the lavatory may be bothersome. The tray table is in the armrest, making the armrest immovable and slightly reducing seat width. There is no floor storage for this seat during takeoff and landing. 53 J None No Power Seat 53 J is an Economy Class Exit Row seat that has extra legroom. However, the proximity to the lavatory may be bothersome. The tray table is in the armrest, making the armrest immovable and slightly reducing seat width. There is no floor storage for this seat during takeoff and landing. 53 K None No Power Seat 53 K is an Economy Class Exit Row seat that has extra legroom. However, the proximity to the lavatory may be bothersome. The tray table is in the armrest, making the armrest immovable and slightly reducing seat width. There is no floor storage for this seat during takeoff and landing. This seat is also missing a window. 66 A None No Power Seat 66 A is an Economy Class seat that may have limited recline. The proximity to the galley may be bothersome. 66 B None No Power Seat 66 B is an Economy Class seat that may have limited recline. The proximity to the galley may be bothersome. 66 C None No Power Seat 66 C is an Economy Class seat that may have limited recline. The proximity to the galley may be bothersome. 66 D None No Power Seat 66 D is an Economy Class seat that may have limited recline. The proximity to the galley may be bothersome. 66 E None No Power Seat 66 E is an Economy Class seat that may have limited recline. The proximity to the galley may be bothersome. 66 G None No Power Seat 66 G is an Economy Class seat that may have limited recline. The proximity to the galley may be bothersome. 66 H None No Power Seat 66 H is an Economy Class seat that may have limited recline. The proximity to the galley may be bothersome. 66 J None No Power Seat 66 J is an Economy Class seat that may have limited recline. The proximity to the galley may be bothersome. 66 K None No Power Seat 66 K is an Economy Class seat that may have limited recline. The proximity to the galley may be bothersome. 67 A None No Power Seat 67 A is an Economy Class Bulkhead seat that has extra legroom. However, the proximity to the galley may be bothersome. The tray table is in the armrest, making the armrest immovable and slightly reducing seat width. There is no floor storage for this seat during takeoff and landing. 67 B None No Power Seat 67 B is an Economy Class Bulkhead seat that has extra legroom. However, the proximity to the galley may be bothersome. The tray table is in the armrest, making the armrest immovable and slightly reducing seat width. There is no floor storage for this seat during takeoff and landing. 67 C None No Power Seat 67 C is an Economy Class Bulkhead seat that has extra legroom. However, the proximity to the galley may be bothersome. The tray table is in the armrest, making the armrest immovable and slightly reducing seat width. There is no floor storage for this seat during takeoff and landing. 67 D None No Power Seat 67 D is an Economy Class Bulkhead seat that has extra legroom. However, the proximity to the galleys may be bothersome. Also, this seat is a bassinet location and passengers traveling with infants may be seated in this area. The tray table is in the armrest, making the armrest immovable and slightly reducing seat width. There is no floor storage for this seat during takeoff and landing. 67 E None No Power Seat 67 E is an Economy Class Bulkhead seat that has extra legroom. However, the proximity to the galleys may be bothersome. Also, this seat is a bassinet location and passengers traveling with infants may be seated in this area. The tray table is in the armrest, making the armrest immovable and slightly reducing seat width. There is no floor storage for this seat during takeoff and landing. 67 G None No Power Seat 67 G is an Economy Class Bulkhead seat that has extra legroom. However, the proximity to the galleys may be bothersome. Also, this seat is a bassinet location and passengers traveling with infants may be seated in this area. The tray table is in the armrest, making the armrest immovable and slightly reducing seat width. There is no floor storage for this seat during takeoff and landing. 67 H None No Power Seat 67 H is an Economy Class Bulkhead seat that has extra legroom. However, the proximity to the galley may be bothersome. The tray table is in the armrest, making the armrest immovable and slightly reducing seat width. There is no floor storage for this seat during takeoff and landing. 67 J None No Power Seat 67 J is an Economy Class Bulkhead seat that has extra legroom. However, the proximity to the galley may be bothersome. The tray table is in the armrest, making the armrest immovable and slightly reducing seat width. There is no floor storage for this seat during takeoff and landing. 67 K None No Power Seat 67 K is an Economy Class Bulkhead seat that has extra legroom. However, the proximity to the galley may be bothersome. The tray table is in the armrest, making the armrest immovable and slightly reducing seat width. There is no floor storage for this seat during takeoff and landing. 76 C None No Power Seat 76 C is a standard Economy Class seat. However, this seat juts into aisle and may often be bumped by service carts or others passing by due to the awkward configuration transition from 3 to 2 seats. The proximity to the galley may be bothersome. 76 H None No Power Seat 76 H is a standard Economy Class seat. However, this seat juts into aisle and may often be bumped by service carts or others passing by due to the awkward configuration transition from 3 to 2 seats. The proximity to the galley may be bothersome. 78 A None No Power Seat 78 A is an Economy Class seat located in the last row of the plane and may have limited recline. The proximity to the lavatory and galley may be bothersome. Also, you will be among the last passengers to deplane upon arrival. 78 C None No Power Seat 78 C is an Economy Class seat located in the last row of the plane and may have limited recline. The proximity to the lavatory and galley may be bothersome. Also, you will be among the last passengers to deplane upon arrival. 78 H None No Power Seat 78 H is an Economy Class seat located in the last row of the plane and may have limited recline. The proximity to the lavatory and galley may be bothersome. Also, you will be among the last passengers to deplane upon arrival. 78 K None No Power Seat 78 K is an Economy Class seat located in the last row of the plane and may have limited recline. The proximity to the lavatory and galley may be bothersome. Also, you will be among the last passengers to deplane upon arrival. 79 D None No Power Seat 79 D is an Economy Class seat located in the last row of the plane and may have limited recline. The proximity to the lavatory and galley may be bothersome. Also, you will be among the last passengers to deplane upon arrival. 79 E None No Power Seat 79 E is an Economy Class seat located in the last row of the plane and may have limited recline. The proximity to the lavatory and galley may be bothersome. Also, you will be among the last passengers to deplane upon arrival. 79 G None No Power Seat 79 G is an Economy Class seat located in the last row of the plane and may have limited recline. The proximity to the lavatory and galley may be bothersome. Also, you will be among the last passengers to deplane upon arrival. All classes feature a 110V AC power supply for your laptop computer and other electronic devices. Cathay Pacific operates the Boeing 777-300 on long-haul flights. This version flies with 42 Business Class seats and 356 Economy Class seats. There is another version of this aircraft that offers 3 extra seats in the Business Class and 3 seats less in the Economy Class. This seat is horrible. the proximity to the galley meant that all of the crew activities could be heard throughout the flight. When I reclined my seat, the foot rest came in contact with the bulkhead. I'm 5'10" on a good day and I my feet were touching the bulkhead. Also, once the curtain to the galley was closed, EVERY time someone went through the curtain, it brushed up against my feet just enough to wake me. this is possibly the worst seat in business class on this flight. The Boeing 777 series have loud engine exhaust because their huge engines are close in to the fuselage. Window seats in the 2:2:2. Business cabin make for impossible to very awkward ausle access when sitting next to a slewping or preoccupied neighbour. The seni recumbent seats do not allow for a confortabke angle of sleep. Because this is an emergency exit row, the booklets, headphones and other papers for all three seats are stuffed into a pocket in the wall, which is right in the face of the person in seat A. Furthermore, the exit door tends to leak cold air from outside, so prepre for very cold legs. The lavatory light will shine directly in your eyes every time someone opens the door, so bring a sleep mask. Also, though this is a "window seat", the window is located in the emergency exit door, which is a good meter in front of the seat. It is impossible to see out while sitting. Finally, though the seat map says there is AC power, I only found USB slots while on this plane, and was very upset by this. I found this seat to have more space and there was not a long que that disturbed either me or my traveling companion to the lavatories. Downside, you get served food last. What a rubbish seat, rubbish cabin. To call this "Business Class" is an absolute joke. They even have a middle seat in the centre block. Uncomfortable, cramped. Great Cathay Pacific service, as usual. But, not really up to their usual standards in terms of the seats. It really ought to be marketed as a Premium Economy seat. It's like an old recliner business seat from the 1980's. I would not recommend this seat/plane for any trip longer than 2-3 hours. 46A and 46K on this CX regional 777 version (77Z) is missing a window, a "be aware - see comments" yellow seat should be labelled. 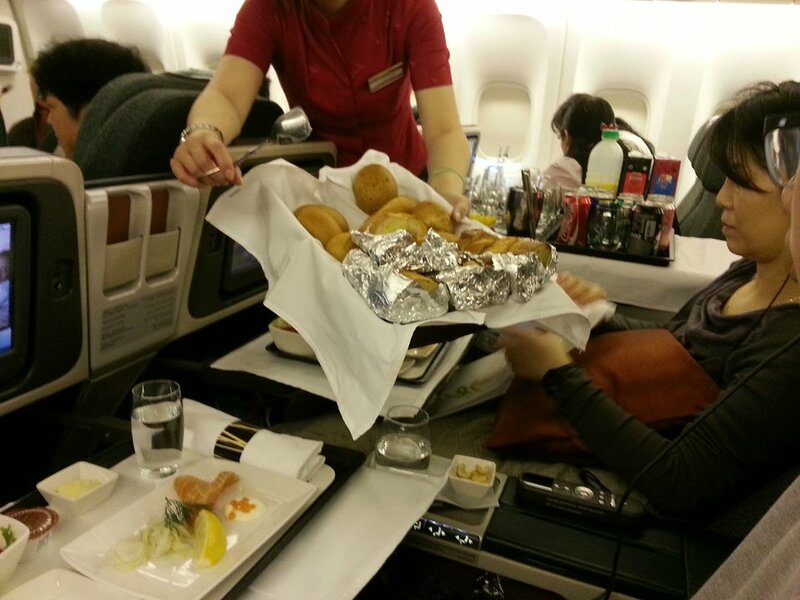 I traveled the sector NRT/HKG in what is billed as Cathay's new regional business class product. Initially, the seat was comfortable, but as the flight went into its 2nd hour, the lack of padding in the seat proved to be uncomfortable to the point of annoying and painful. Getting from the window seat to the aisle also required that I ask my seat mate to sit up , thereby inconveniencing her. In general, I would say it is an okay product but not something to look forward to using. Cathay Pacific flies 1 versions of Boeing 777-300 (77Z) Layout 2.